This article is about cattle used for work. For other uses of ox or oxen, see Ox (disambiguation). For other uses of bullock, see Bullock. Zebu pulling an ox cart in Mumbai, India. Working oxen are taught to respond to the signals of the teamster or ox-driver. These signals are given by verbal command and body language, reinforced by a goad, whip or a long pole (which also serves as a measure of length: see rod). In pre-industrial times, most teamsters were known for their loud voices and forthright language. Ox trainers favor larger animals for their ability to carry and pull heavier loads. They are therefore usually of larger breeds, and are usually males because they are generally larger. Females can also be trained as oxen, but they are smaller; they are often more valued for producing calves and milk. Bulls are also used in many parts of the world as oxen, especially Asia and Africa. Working oxen usually have oxshoes, which are metal devices nailed into their hooves, used to protect them from excessive wear. The continual strain borne on their feet by the weight they carry may injure and lead to cracking of the hooves, just as with horses. Despite this, in England, not all working oxen were shod. Since their hooves are cloven, two separate parts are required for each hoof, unlike the single shoe of a horse. Oxshoes are usually of a flat shape with an outline similar to a half-moon or a banana, either have or do not have caulkins, and are fitted in symmetrical pairs to the hooves. Unlike horses, oxen are not easily able to balance on three legs while a farrier shoes the fourth. In England, shoeing was accomplished by laying the ox on the ground and lashing all four feet to a heavy wooden tripod until the shoeing was complete. A similar technique was used in Serbia and, in a simpler form, in India, where it is still practiced. In Italy, where oxen may be very large, shoeing is accomplished using a massive framework of beams in which the animal can be partly or completely lifted from the ground by slings passed under the body; the feet are then lashed to lateral beams or held with a rope while the shoes are fitted. While less efficient and sensibly less prevalent than horses, the riding of cattle as a means of transportation has happened throughout history, and the act is sometimes known as ox riding and oxback riding. There are many forms of riding equipment used by oxen, and some slightly differ from those used by horses. A wide-girthed saddle is mounted on the ox’s back for the rider to sit on. A bridle may attach to reins that the rider holds to direct the animal; alternatively, they may have a nose ring pierced through their septum that is directly attached to reins or attached to a bridle that is attached to the reins. While horses may have a bit, the near-equivalent for cattle is the nose ring, although this procedure is painful to the ox. As previously mentioned, they are not only controlled by being steered using reins; working animal-voice commands (giddyup, whoa, gee, haw, and back) are also used to signal the starting, stopping, and direction of movement. Cattle are far less comfortable to ride than horses, as they are much wider. Thus, the rider’s legs must be considerably far apart from each other. Oxen can pull heavier loads, and pull for a longer period of time than horses depending on weather conditions. In addition, well-trained oxen are considered less excitable than horses. [by whom?] On the other hand, they are also slower than horses, which has both advantages and disadvantages; their pulling style is steadier, but they cannot cover as much ground in a given period of time. For agricultural purposes, oxen are more suitable for heavy tasks such as breaking sod or plowing in wet, heavy, or clay-filled soil. When hauling or being ridden, oxen can move very heavy loads in a slow and steady fashion. They are at a disadvantage compared to horses when it is necessary to carry or pull a load relatively quickly. ^ a b c Williams, Michael (17 September 2004). "The Living Tractor". Farmers Weekly. Archived from the original on 3 March 2011. Retrieved 22 May 2011. ^ a b Watts, Martin (1999). Working oxen. Princes Risborough: Shire. ISBN 0-7478-0415-X. Archived from the original on 2014-06-12. ^ a b Baker, Andrew (1989). 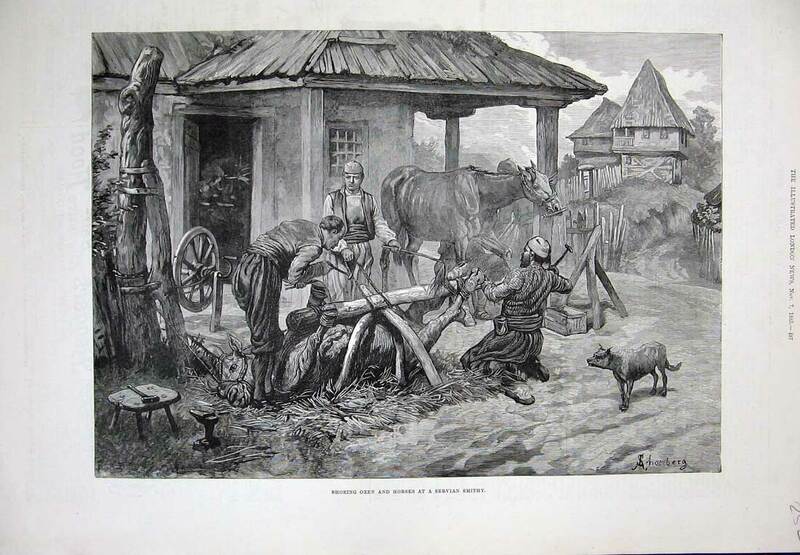 "Well Trained to the Yoke: Working Oxen on the Village's Historical Farms". Old Sturbridge Village. Archived from the original on 26 September 2011. Retrieved 22 May 2011. ^ "Blacksmith shoeing a Bullock, Calcutta, India" (stereoscope card (half only)). Stereo-Travel Co. 1908. Retrieved 22 May 2011. ^ "Did You Know?". Wet Dry Routes Chapter Newsletter. 4 (4). 1997. Archived from the original on 22 July 2011. Retrieved 22 May 2011. ^ a b "Saddle Your...Cattle? Kimberly Henson's Saddle-broke Steers". horsenation.com. ^ "Riding the Ox - Sue Weaver". storey.com. ^ Conroy, Drew. "Dr" (PDF). Ox Yokes: Culture, Comfort and Animal Welfare. World Association for Transport Animal Welfare and Studies (TAWS). Archived (PDF) from the original on 22 March 2012. Retrieved 21 February 2012.